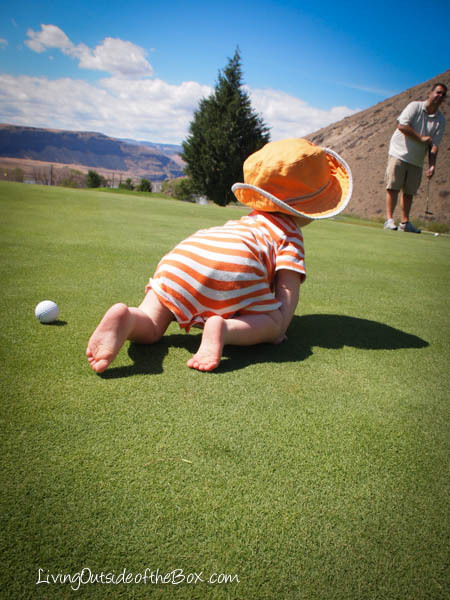 I’ve never been golfing before. 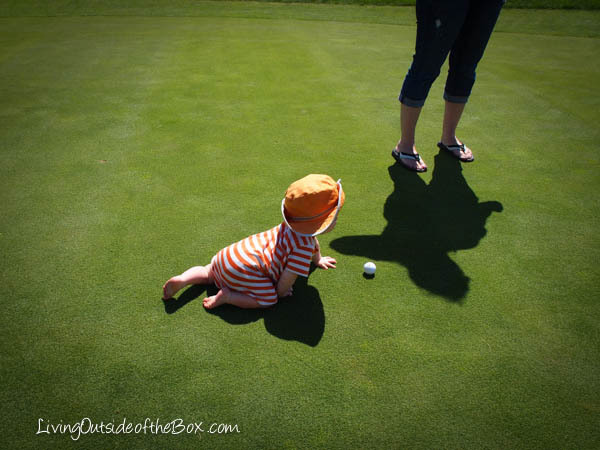 I’ve been hesitant to try–as I’m not always the most coordinated with my hands. I grew up as a soccer player–and feet–I can handle–but hands? Clubs? Ack! 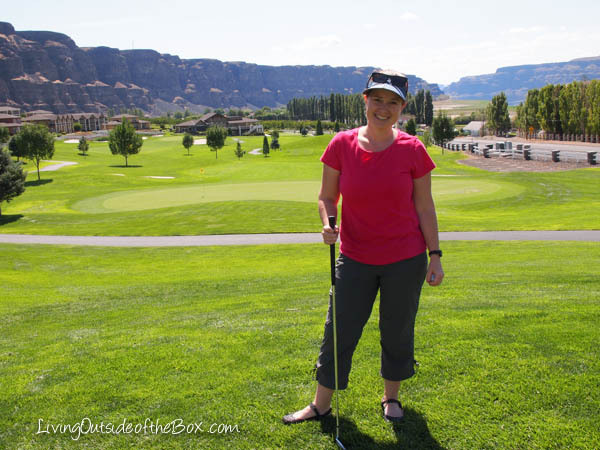 My husband’s family is from Central Washington, and nearby to his hometown is the tourist destination of Crescent Bar–a little island on the Columbia River, just off of I-90. It is described as “a vacation paradise perfect for fun, sun, golf, tennis, fishing, jet-skiing, wakeboarding …and sometimes absolutely incredible water-skiing conditions. 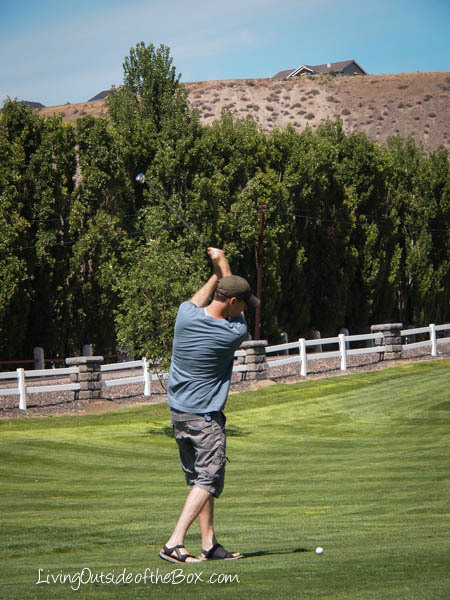 So–for our August 2014 Family Reunion, a bunch of us decided to go enjoy some golfing in Crescent Bar. Jared’s golfed a handful of times back in his early 20’s. Me? I’ve only been miniature golfing–or as I would call it “Goony Golfing” (the name of the local mini golf biz where I grew up)! Jared looked good. Not that I would know what good or bad form is, however. And the rest of the view wasn’t bad, either! We didn’t play a “formal” game—but we all had fun and I quickly improved my game. I would certainly love to go again! 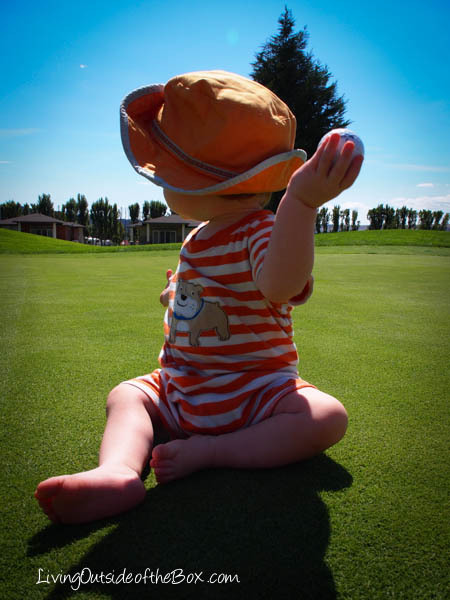 Eli–one year old–had only one thing in mind: get the balls! 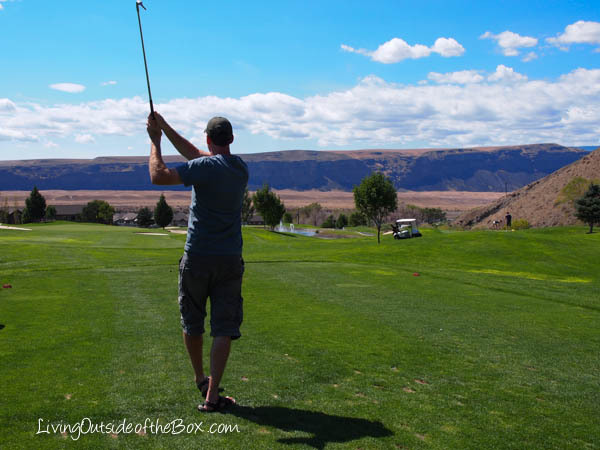 Crescent Bar has a 9 hole, par-3 course, and the prices were very affordable–no crazy price gauging here! It is located on the Sunserra resort with vacation rentals, a great pool, nearby camping, water sport rentals (jetskis, boats, SUP-stand up paddling), and it even has shuttles to the nearby Columbia River Gorge amphitheater –a topnotch performance venue that attracts the best entertainers. The nearby school district brings kids out to Crescent Bar to canoe, and there is also a great little beach for kids to safely play as parents relax. Overall, it’s a fun little destination!